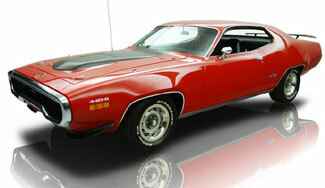 At Best of Show Automotive, we love rare cars like this '71 Plymouth GTX. We get even more excited when they are super-clean, low-mileage cars. And when they're loaded up with uncommon performance options, documented, and numbers matching, for us, it's like winning the lottery! The Plymouth GTX was the upscale companion to the budget-muscle Road Runner. Both were part of Chrysler's revamped 71 midsize line (which also included the Dodge Charger), and both got curvaceous new "fuselage" styling on a wheelbase one inch shorter than the previous year. Although Mopar was the slowest of the Big Three to scale back, not all its V-8s escaped detuning. The Road Runner's standard 383-cid four barrel, for instance, lost 35 bhp. 71 GTX engines, however, held out relatively unscathed. Compression ratios were shaved slightly, but the standard 440 four-barrel and the optional triple-two-barrel 440+6 lost only five horsepower, to 370 and 385, respectively. The extra-cost and seldom-ordered 426 Hemi held fast at 425 horsepower. Four-speeds and TorqueFlites, with axle ratios up to 4.10:1, were still available, as was the Air Grabber hood. That body work was expertly done, and the Rally Red paint shines on wrinkle-free panels. The decals have been applied in all the right places, and even the stainless trim on the rocker panels shines like new. Underneath, the rust-free floors have been carefully undercoated as original with zero overspray. In addition, many of the chassis components have been detailed like new. The exhaust and gas tank appear to have been recently installed.